LUHANSK, Ukraine -- Six Ukrainian soldiers have been killed in two separate incidents in the east of the country, government officials say. Russia denies supporting the rebels with troops and heavy weapons. Four died after their vehicle was reportedly fired on by pro-Russian separatists in Schastye, close to the separatist stronghold of Luhansk. 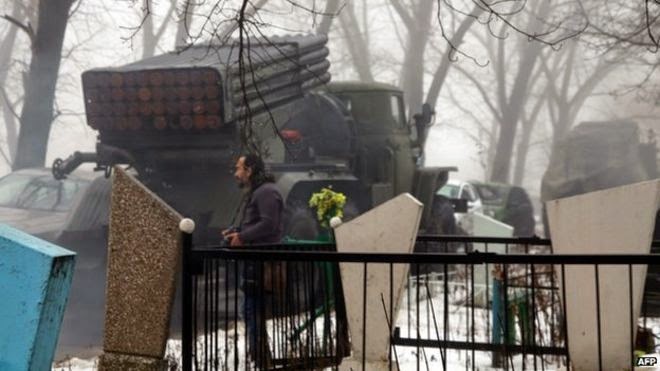 Two others were killed when their vehicle hit an anti-tank mine near the government-held port city of Mariupol. A fragile ceasefire has been in force in eastern Ukraine since February. There have been isolated violations of the ceasefire, which was agreed by leaders from Ukraine, Russia, Germany and France. In the Schastye incident, the four Ukrainian government troops are said to have died when their vehicle was hit as it drove across a bridge . Initial reports said rebels "had fired an anti-tank missile", the interior ministry said in a statement. In the mine explosion near Mariupol, two soldiers died at the scene while a third was wounded and taken to hospital, the army said. On Saturday, the government reported the deaths of three soldiers in a mine explosion near Donetsk, another separatist stronghold. More then 6,000 people have been killed since fighting broke out in eastern Ukraine between pro-Russian separatists and the Ukrainian government a year ago. The Ukrainian government, Western leaders and NATO say there is clear evidence that Russia has helped the rebels with heavy weapons and soldiers. Independent experts echo that accusation. Moscow denies it, insisting that any Russians serving with the rebels are "volunteers".